Birthmark is a surreal exploration of the concept of rebirth. Throughout the story we explore the unconditional love of a mother, the role that she has to fulfil and the fear of losing a child. This film aims to take the viewer through a surreal journey of a suburban family, that’s challenging, unnerving and obscure. Jack is surrounded by two world. One seems like an ordinary suburban life where he lives with his family and his toys. The other is the presence of another person. His room is split between the boys toys and that which resembles the interior of an elderly woman. The objects are personalised the audience feels the meaning behind each item as if they were carefully selected. The script carefully balances the art between horror and imagination- the essence is in the balance of the two. Is Jack being haunted by Maria a woman from the past or is there another element at play? This is where the power of the script lies and why I feel it would work as a powerful short film. The tone of this film should play with the surreal nature of the script while engaging with it's suburban set up. I think the film should be shot like an atmospheric tension keeping the photographic works of Gregory Crewdson and Philip Lorca diCorcia in mind and combine these with the feel of movies such as Let’s talk about Kevin. The film threads along the line of the obscure and the known, moving in and out of the real and surreal. First we question the reality of Jack’s affliction but with each scene we sink further into this new eerie reality. Birthmark, examines issues of intimacy, family dynamics and human connection whilst allowing the audience to surrender to a visually stimulating script. By filming this film as a horror we can connect to core issues of the film without having to spell them out word by word. By creating atmospheric tension in the imagery we can play with the audiences perception allowing them to be lead deeper into the mystery of the film. Horror films allow us to reflect on the harsh realities of our present moment, on conditions that are difficult to confront head-on. Though this film is set in a surreal reality, horror can function as a window on, and critique of, the present. Birthmark, comments on the fears of being different whilst emphasising the depths of a mothers love. It allows the audience to imagine the strength and courage it takes to stand by your child rather than giving up on them. From the outside the family might seem quite normal but there is something wrong with this picture. It is important to highlight the growing isolation of Maeve within the family. She does not know how to help Jack and is at odds with her husband. Hard working and dedicated, in a routine, servant to the family. Most human, real, relatable compared to her family. Her family becomes more and more robotic with the presence of the SMEG. They become products just like the SMEG. There is an underlying edge to his nature. He is distant and cold. There is a story between himself and Jack that the audience can feel through the cold edged distance he keeps between them. These children look like picture perfect cut outs of children. Angelic in appearance but there is something unsettling beneath his smile. Every time you trust him there is something in his look that makes you second guess him. The Colour palette for this film should emphasise the atmosphere created in the script. Dark greens and blues will allow depth and mystery, while adding a pop of colour such as yellow or red will lift certain elements in the composition. Lighting and feel reminiscent of the photography by Gregory Crewdson and Philip - Lorca diCorcia. The obscure and the real - the battle between comfort (home) and discomfort (the presence of an outsider). Within the composition we are creating a space for isolation, although Jack is part of the family he feels separate from them. Visually there should be a meditative rhythm to the camera. The camera observes the family creating an atmosphere like someone is watching. The viewer should feel an otherness, an uncertainty of what is going to happen next. They should feel like they cannot trust exactly what is going on. Jack appears removed from the world. There is a fierceness & determination to the mothers character. There is an other worldly quality to Jack’s birthmark. The colour should also differ from his complexion so that it seems like it is taking him over. The soundtrack of Gone Girl is strong in creating tension and atmosphere while the soundtrack of Ex- Machina gives the edge and feel of 'the other' (of another world). Both references would work well for the score for Birthmark. Birthmark comments on the fear of the other and things you do not understand. It is a mystery that is brim with surreal imagery. It is a visual exploration of a family deep in the throws of a life changing mystery. The audience for this film would be those that enjoy a mystery, an obscure horror that toys with the ideas of reality. The viewers drawn to this film would be those that enjoy watching films such as It follows and Let’s talk about Kevin. Janna Kemperman is a filmmaker and choreographer based in Dublin. Her practice explores the interplay between film and movement, which come together to form experimental narrative films that examine identity and human interactions. Janna graduated from IADT in 2013 after which she went on to work in film in Germany and Ireland. She has since returned to Ireland to concentrate on her won work as a director and filmmaker. 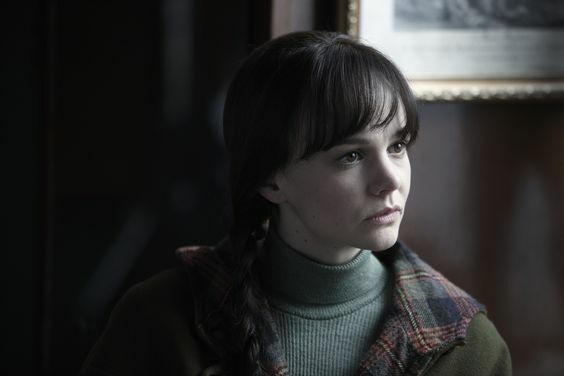 Her most recent work was HEN, a psychological thriller and Everything Not Saved which was part of RTE’s Storyland 2018. Her short film ‘Waiting on a Train’ won the audience award, best film and best director at the 48HFP in Dublin and went on to screen in England and America.